While those eating finished, we welcomed an old friend from the Didcot Games Club on his first visit, and began the evening began with a quick game of an old classic, High Society. 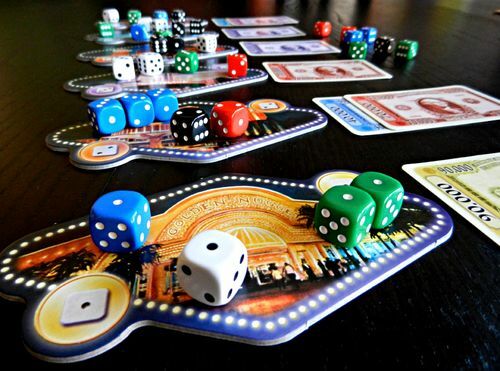 Designed by Reiner Knizia, this is a light bidding game with a catch, in the mold of games like For Sale, No Thanks!, Modern Art, and perhaps our old favourite, Las Vegas. 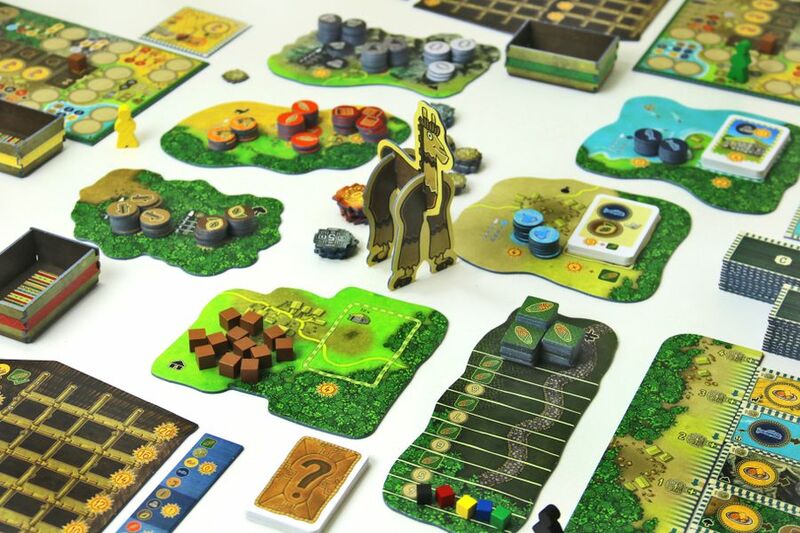 First released over twenty years ago in the designer’s heyday, a beautiful new edition has recently been published by the Cumnor Hill-based company, Osprey Games. In High Society, everyone starts with the same set of money cards, each numbering from 1,000 up to 25,000 Francs. The game is all about correct valuations. Players take it in turns to bid for the luxury objets d’art for sale, however, when they increase their bid, they add money cards to their personal bidding pile, and there is no concept of change. 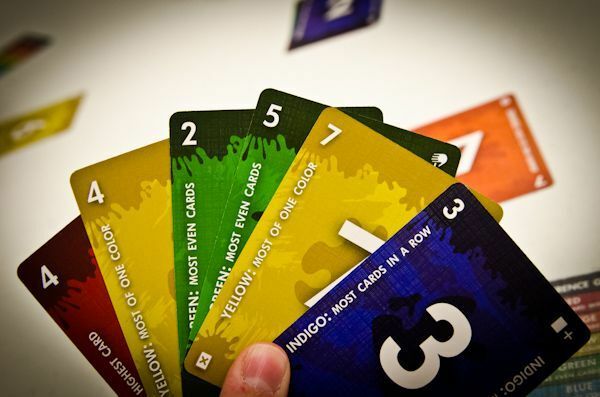 Thus, as the game progresses, players have fewer and fewer bidding options as they spend their money cards, and are increasingly forced to big large amounts potentially for relatively low value items. 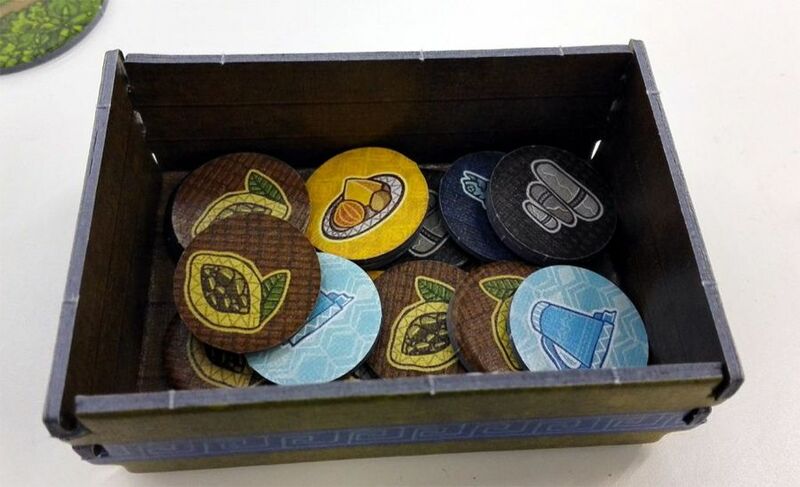 Some of the objects for sale are not so much art, as artless, and can halve a player’s score, lose them points, or even cause them to discard something they purchased previously and the first person to withdraw, “wins”, while everyone else pays whatever they wagered. The other twist is at the game end which occurs abruptly when the fourth “end game” card comes out. At this point, the player with the least money at the end is eliminated regardless of the value of their luxurious objects. Despite the age of the game, a lot of people were new to it, and as the valuation of the luxuries is the key, some people found knowing how much to bid challenging. As is the case with this sort of game though though, until the scores were actually calculated nobody knew who was winning, especially as the money was tight at the bottom. Purple and Black (or “The Dark Destroyer as Ivory called him”) had pots of cash, but Red was just eliminated ahead of Yellow. That left the final count: Black was by far the most efficient, with a score of fourteen, two more than ivory – quite remarkable given the amount of cash he had left at the end. It was Yellow though, who having just escaped elimination, finished some way in front with nineteen points. With everyone fed and High Society over, we split into two groups: one to play the “Feature Game” (which was to be Keyflower) and the rest to play something else. As always, the issue was what the other game was to be and almost everyone was happy to play Keyflower, but for some, the final decision depended what the other game was to be. The problem was that the choice of the second game depended on who was going to play it. Eventually, Purple broke the deadlock when she said she would be happy not to play Keyflower. With Red having requested it in the first place, and it being Blue’s favourite game, it was just a matter of who would fill the remaining seats. 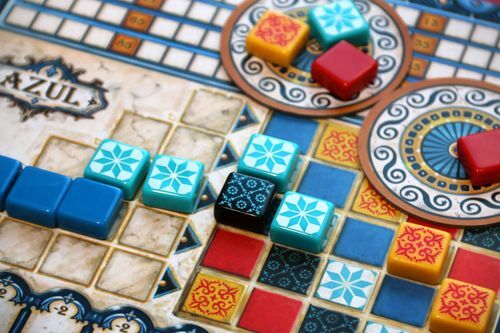 In the end, Pine, Burgundy and Ivory joined Red and Blue, leaving Yellow, Black and Purple to play Calimala, an area-influence driven, worker-placement game set in the Republic of Florence during the Late Middle Ages. This is an unusual game with variable setup to keep it fresh. 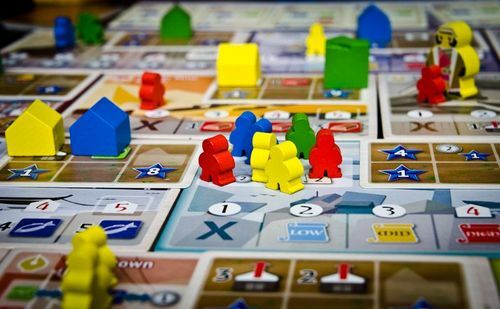 The idea is that on their turn, players place one of their workers on one of the twelve worker spaces. Each one of these is adjacent to two of the nine action spaces. 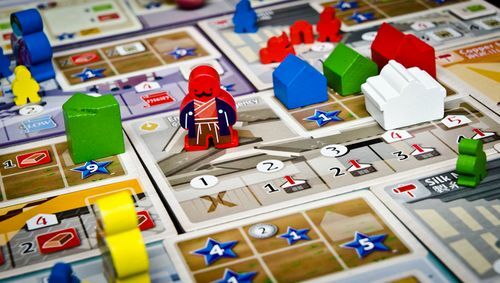 If there is already a worker disk present on the space, once the active player has carried out their actions, then the other player gets another turn. This continues until a player places the fourth disk on a stack: actions are carried out for the top three disks and the fourth is placed on the first available scoring tile which is then triggered. Each player has some worker disks in their own colour and a small number in white. Coloured disks give players a maximum of two actions on three occasions (i.e. a total of six), while white disks give four actions when played, but none later in the game. The actions include acquiring resources (brick, wood or marble), building (ships, trading houses or workshops), create artwork, produce cloth, transport cloth, and contribute to the building of the churches. The fifteen scoring phases are built on the actions, rewarding players for the amount of cloth they have shipped to a given city or combination of cities for example, or for their contribution to a specific building, or their contribution to the building effort of a given resource. In each case, the player with the most scores three points, the player in second place scores two and the player in third gets just one point. In case of a tie there is a complicated series of tie-breakers. 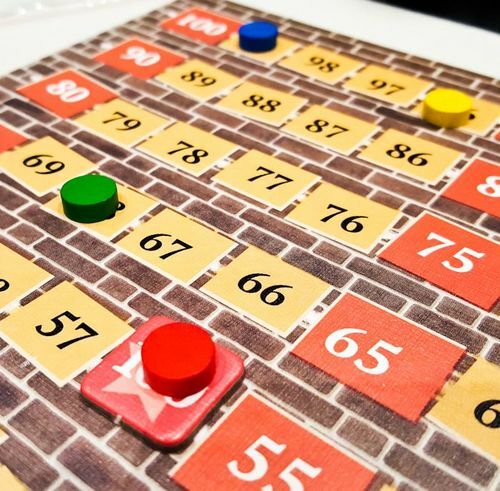 The game ends when either all fifteen tiles have been scored, or everyone has placed all their workers (in which case any remain tiles are scored). 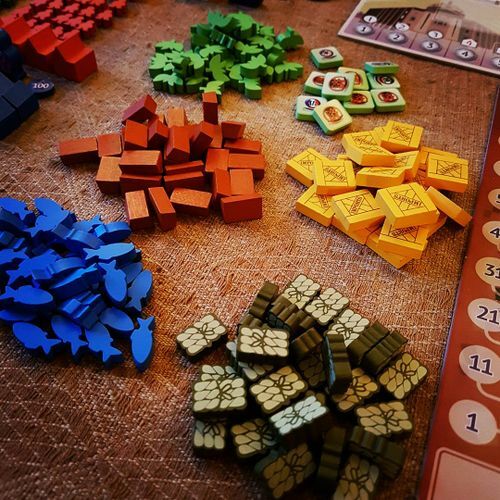 It was another close game: “The Dark Destroyer” scored heavily for the cloth in the Port Cities (Barcelona, Lisbon and London), while Purple scored for the trading cities (Troyes, Bruges and Hamburg). 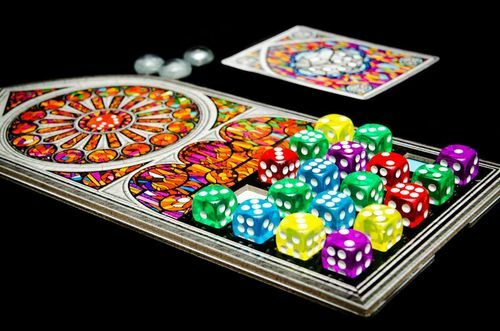 Calimala is one of those games that rewards players who score “little and often”, and it was Yellow who managed to score most frequently. There were a lot of tie-breaks however, particularly between Yellow and Black and it was probably the fact that Yellow did better in these that tipped the balance, as he finished just ahead of Black with a winning score of forty-five points. 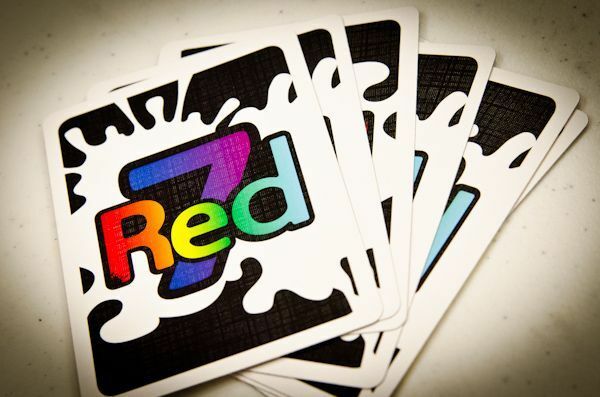 Keyflower was still under way, so the players looked around for something quick to play and picked one of Yellow’s favourite games, Red7. On the surface, this is a fairly simple game, but underneath it is much more complex. 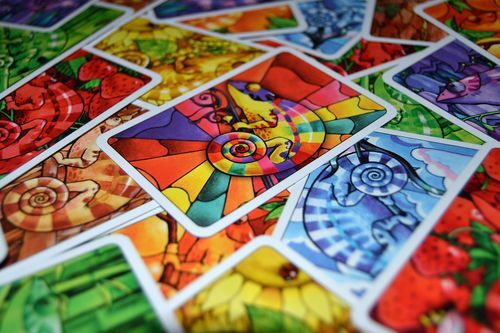 The game is played with a deck of forty-nine cards, numbered one to seven and in seven different colour suits. Each player starts with seven cards in hand and one face up on the table. The player with the highest value card is “winning” because the rule at the start is that the highest card wins. 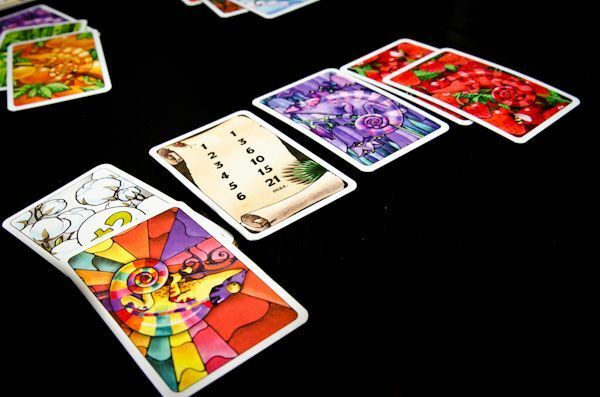 On their turn, each player can play one card from their hand into their tableau in front of them, or play a card into the centre which changes the rules of the game (a little like Fluxx), or they can do both. If they cannot play a card or choose not to, they are out of the round. In the event that there is a tie and the highest face value is displayed by more than one player, the tie is broken by the colours with red higher than orange and so on through the spectrum to violet. The colours also dictate the rules, so any red card played in the centre will change the rules to “the highest” wins. Similarly, any orange card played in the centre changes the rules so that the winner is the person with the most cards of the same number. In each case, if more than one player satisfies the rules, the tie is broken by the card that is highest (taking into account both number and colour). Thus, if the rule is “the most even cards” and there are two players with the same number of even cards in front of them, the player with the highest even card is the winner. At the end of their turn, the active player must be in a winning position, or they are out of the round. The round continues until there is only one player left. We last played this a few years back when we made rather heavy weather of it. Part of the problem was that there were several of us and we were all new to it. This meant we struggled without someone to lead the way. With Yellow very familiar he was able to show everyone else how to play. Inevitably, this meant he won (giving him a hat-trick). The game was played over five rounds and at the end of each round the player who was left at the end kept their highest cards. With Yellow so much more familiar with the game than anyone else, it was inevitable that he would be able to build on this, and he made the most of it. By this time, the next table were just coming to the end of their game of Keyflower, and we had all found it unusually hard going, that is to say we all struggled to find anywhere to score points. 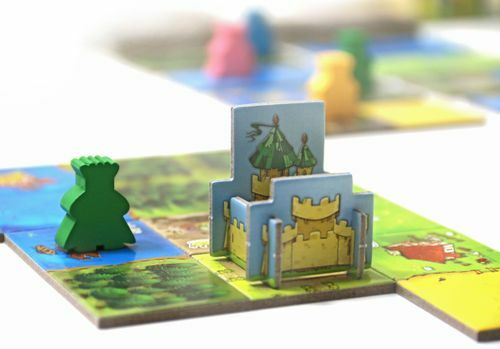 The premise of the game is quite simple: over four rounds (or seasons) tiles are auctioned using meeples (or Keyples) as currency. The clever part is that to increase a bid, players must follow with the same colour. Keyples can also be used to perform the action associated with a tile, any tile, it doesn’t have to be their own, but each tile can only be used three times in each round and, again, players must follow the colour. The aim of the game is to obtain the maximum number of victory points at the end. However, the highest scoring tiles aren’t auctioned until the last round (Winter), so players have to keep their options open. 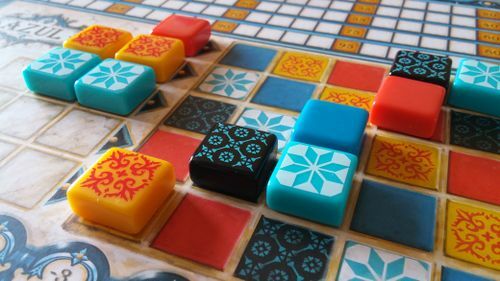 On the other hand, the tiles that are auctioned in Winter are chosen by the players from a hand of tiles dealt out at the start, so players can choose to take a steer from that, or, if things go badly wrong, decide not to include certainly tiles. These games are nearly always memorably epic and this was definitely no exception. The game started of with Ivory declaring that while he loved it, he thought it was maybe “a bit broken” because in his experience, there was one winter tile that would guarantee a win to the player that got it. Blue and Burgundy thought they knew he was referring to “The Skill Tile Strategy” and agreed it was powerful, but felt it wasn’t over-powerful. Blue said she thought it was only a guaranteed win if everyone else allowed it. Pine suggested that playing the game would give Ivory another opportunity to gather evidence to see if this was the case. As soon as the winter tiles were dealt out, it was clear that Ivory had one of the tiles that rewarded players with lots of Skill Tiles, and everyone knew what his strategy was going to be. Spring started and it quickly became clear that it was going to be a fight. Initially, Blue went for the Peddler which converts yellow Keyples into Green ones, but Pine thought that sounded good, and outbid her. Next she went for the Miner which gives two coal, upgradable to three, but Red outbid her on that. Somewhat in error she tried to get the Woodcutter which gives two wood (upgrading to a wood and a gold), but Burgundy outbid her. Ivory also got in on the act, beating her to the Keystone Quarry, which meant Blue finished spring with no Village tiles at all. At least she didn’t over-pay for anything though, and it meant she had plenty of Keyples to bid with for Summer, at least in theory. The lack of tiles meant she didn’t have a strategy though, while everyone else was beginning to build theirs. With summer came a whole new set of interesting tiles, for Ivory, that included the Hiring Fair which gives two tiles in exchange for one (upgradable to three tiles for one). Given that Ivory had telegraphed his plans, and that Burgundy took one for the team during Concordia last time (when he took the Weaver and gave everyone else a chance), Blue felt it was her turn and she made it her business to outbid him, even though this gave her a tile she had very little use for. As the only one with any meeples to speak of, Blue managed to pick up three boats relatively cheaply too. She didn’t have it all her own way though, as Pine took the Farrier (extra transport and upgrade ability) and Ivory took the Brewer who turns skill tiles into Keyples. Unusually, there had been a lot of bidding for the end of season tiles and it came to a peak in autumn with everyone jostling for position for the final round. 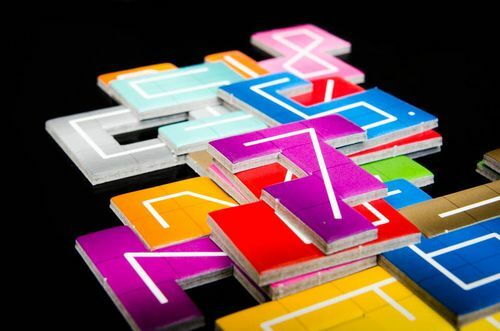 The other tiles were generally less popular, however, and most people were trying to keep their Keyples to themselves where possible, hoarding them for the final round. And it was in the final round that it all came to a head. Everyone had to put in at least one tile, but nobody seemed terribly keen to put any in. Blue had contrived to win the start Keyple at the end of autumn, and started by bidding for the Key Guild tile which had been put in by Ivory. Inevitably this descended into a bidding war, which Blue won. The Key Guild tile gives ten points for any five skill tiles, so Blue was finally able to use her Hiring Fair to get points. Having had his plans scuppered, Ivory moved on to messing with Pine’s plans, while Red engaged Burgundy in a bidding war for the Jeweller tile (which increases the value of gold from one point to two), and lost. It had been a really tough game with points really hard to get hold of, and that was visible in the scores. It was very tight with just six points covering Red, Burgundy, Ivory and Pine and all of them in the low to mid forties. Blue finished with sixty-one however, thanks largely to her twenty points for her skill tiles and sixteen for her boats. It had been a very stressful game, that led to a considerable amount of discussion. Ivory felt the fact that Blue had won using skill tiles confirmed that they were over-powered, but Pine and Burgundy were less certain, so the jury is still out. Blue said that every game was different and the point was that it was up to other players to stop the person who is making a beeline for skill tiles, in fact, that was exactly what she had done to Ivory, as he put that tile out in winter. The discussion would have continued, however, it was getting late and people began to leave. Pine, Burgundy and Blue felt there was just time for a quick game of NMBR 9. This little game has been a real success within the group, mostly at the start as a warm-up game, but occasionally as filler too. Pine took the deck of cards and began turning them over, with everyone else taking the number shaped tiles and adding them to their tableau. It was another tough, tight game, but Blue managed to squeeze one of her eights on to the fourth level giving her twenty-four points for that tile alone. Aside from that, the levels and therefore the scores were very similar, so Blue took victory by twenty-one points from Pine in second place. Learning Outcome: Sometimes it is better to keep your plans to yourself. 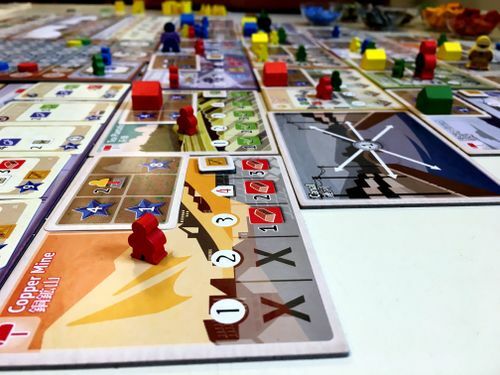 This entry was posted in Games Night and tagged Calimala, Concordia, Fluxx, For Sale, High Society, Keyflower, Las Vegas, Modern Art, NMBR 9, No Thanks!, Red7 on July 24, 2018 by nannyGOAT. Unfortunately, ordering dinner was delayed due to a birthday party on the other side of the room, so Blue, Pine and Burgundy decided to get in a quick game of NMBR 9 while they waited. Despite the fact that it isn’t a top game for anyone and takes up a lot of room in the bag, it is is rapidly becoming a very popular filler. This is because it is nice and short, has a enough bite to keep everyone interested for the duration and, as it has almost no set-up time, the activation energy barrier is particularly low (find and open the box, take out the deck of cards and turn over the top one…). 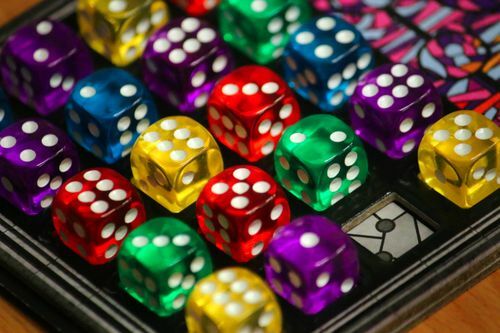 The game is a bingo-type tile-laying game where each person plays a total of twenty tiles, numbered zero to nine, with each one appearing twice. The deck of cards dictates the order they appear in and tiles must be placed such that at least one edge touches a previous tile. Tiles can be placed on top of other tiles as long as there are no overhanging parts, and the tile sits squarely on more than one other tile. 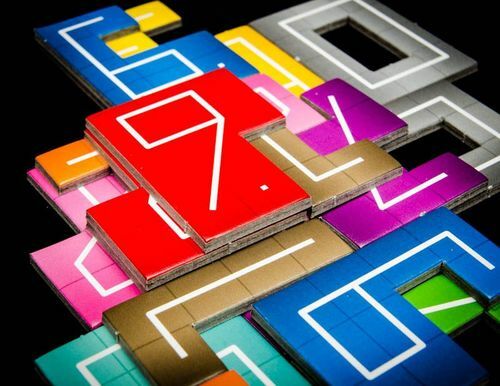 At the end of the game the number of the tiles are multiplied by the level they sit on minus one. So, a five on the third tier scores ten points (5 x (3-1)). This time, everyone started off with the same placements albeit in a different orientation. It wasn’t long before first Burgundy and then the other two diverged though, with slightly different strategies. There is a bit of knack to the game with two basic competing requirements: getting strong continuous layers without gaps, and placing numbers, ideally high numbers, on the highest tiers possible so they score more. Blue and Burgundy concentrated on getting a really solid zero level with Burgundy even sacrificing his first “nine” to the cause. Pine on the other hand, succeeded in placing both his “eights” on his third tier scoring a thirty-two points for those tiles alone. It was a very close game, but the difference was when, towards the end of the game, Burgundy managed to squeeze a “three” onto the fourth layer. This gave him nine points and victory with a total of sixty-three points, just five points ahead of Blue and Pine, who tied for second place. By the time NMBR 9 was finishing, everyone else was arriving and the group split into two, with one group playing the “Feature Game”, Boomtown and the other playing Yokohama, a game which Ivory had been hankering after playing since he first saw it long before Christmas. With food due for Blue and Burgundy at anytime, Ivory had to wait another twenty minutes or so, and to try to keep his mind off the delay, the trio decided to squeeze in another filler, Coloretto. This is a light set-collecting card game that everyone in the group is familiar with: on their turn, players can either pick up a chameleon card from the face down deck and add it to a truck, or take a truck (passing for the rest of the round). The innovative part of the game is the scoring which uses the triangular number sequence (one point for the first card, three points for two cards, six points for three cards etc. ), with positive points for three sets and negative for the rest. We’d just started when food arrived and it quickly became apparent that Blue was concentrating more on her pizza than the game as she just stared collecting almost anything that came her way. Everyone started collecting light blue/white cards and this was a mistake because it meant that everyone was going to struggle to get lots of them. In the end, three things made the difference: the jokers that Blue picked up; the bonus point cards that Blue and Ivory collected, and the negative points that Burgundy ended up with. As a result, despite her lack of concentration, Blue finished with forty-four points and a sizeable lead, with Ivory in second place. Meanwhile, the next table had started the “Feature Game”, Boomtown, which is a fairly light card game where players are mining moguls and each round is divided into three parts, auction, selection, and production. At the start of the round one card is drawn per person and placed face for bidding. 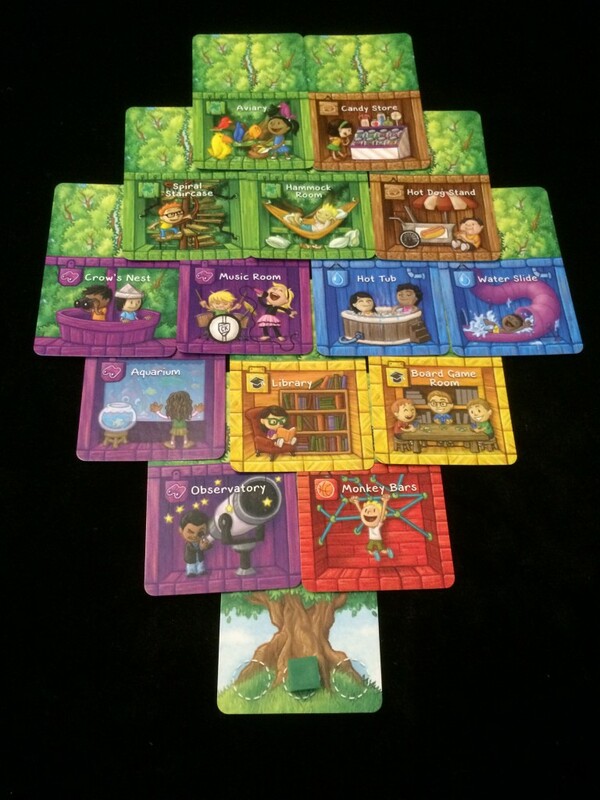 Players then, in clockwise order, take turns bidding for who gets to choose a card first. Bidding continues round the table; when a player passes then they are out of the bidding and the auction continues until there is one person left. While the auctions are fun, the real twist in the game is what happens as a result of the auction. Winning the bidding has two consequences: first pick from the cards available, but also payment of the bid to the other players. So, the winner of the auction pays his winning bid to the player on his right who then gives half of that sum to the player on his right who, in turn, gives half of that amount to the player on his right, and so on in anticlockwise order, stopping just before the player who won the bidding. The winning bidder chooses first and selection then passes to the player on his left and continues in clockwise order (i.e. opposite to the order of the money route). There are two types of cards in Boomtown, mine cards and special cards. The special cards typically provide a one off action that must be used straight away while others can be saved for later in the game. Some help the owner, but most target one, several or all of the other players destroying or stealing mines, changing dice rolls or the order of a result of an auction. 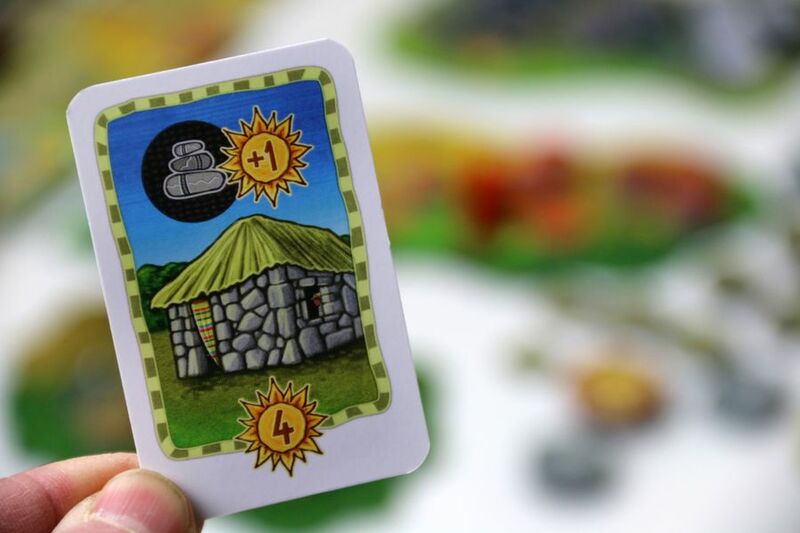 Mine cards provide victory points and can also be a source of income throughout the game (especially valuable as money enables players to take control during the auctions). 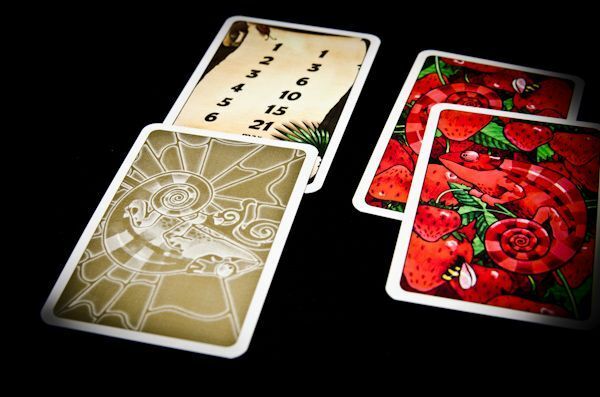 Each mine card has a number of gold coin symbols on it as well as a number between two and twelve. 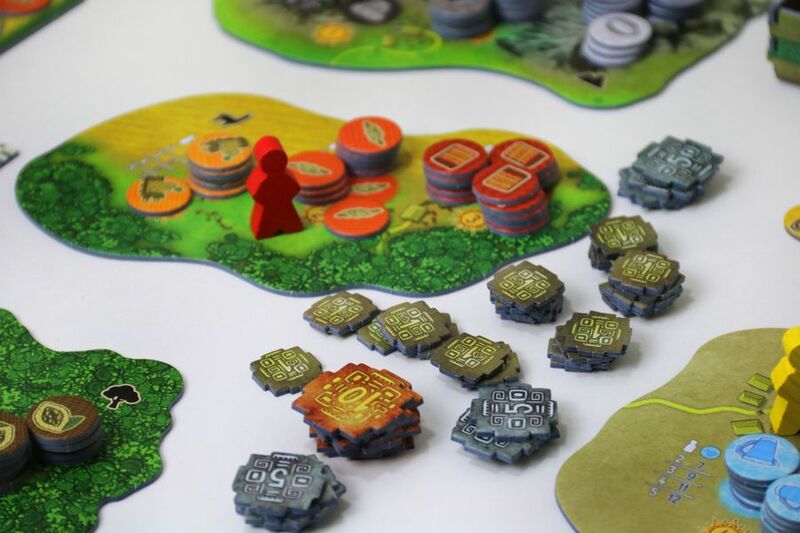 The gold coin symbols correspond to the number of victory points the card is worth at the end of the game and the number of chips a player will receive should the card’s number be rolled during the production phase (like in The Settlers of Catan). 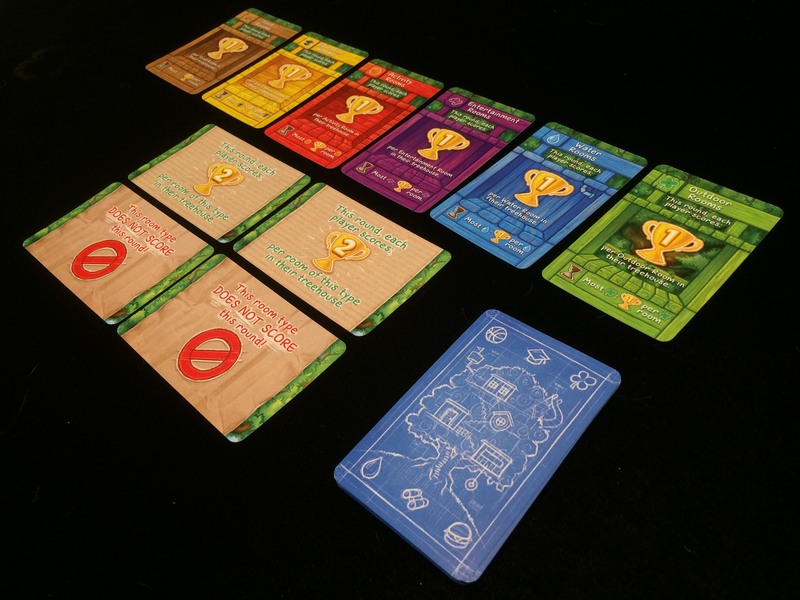 Each mine card also has a colour and these can be critical as the player with the most cards takes the mayor who is worth five points at the end of the game. Perhaps more importantly, the player who owns the mayor receives payment from the other players when they take (build) a mine of that colour. Mayors can also be a deciding factor in how one bids for first choice in a round and some of the special cards can provide an edge in the contest for mayors, as well. This means that fights over mayors can get very, very nasty indeed. 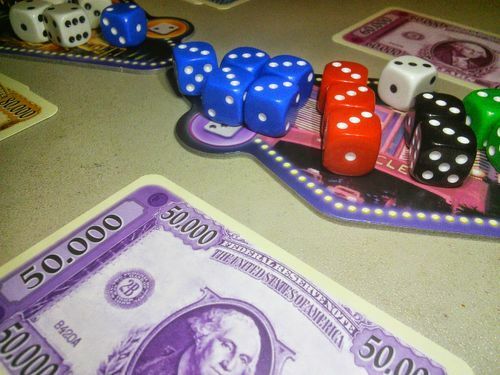 The game ends when the deck is exhausted and everyone then adds their number of chips to the value of their mines and any mayor bonuses, the player with the highest total wins. It was a slow start with no-one really bidding very high. Most people were not sure quite how the game would work so did not want to commit too much at this early stage. In the very first round, the “aggressive” nature of the game quickly reared its ugly head when four of the five cards in the auction were mines and one was Dynamite. Green won the bid and since Red was sitting on his right, she was left with the final card, the Dynamite. There was really only ever one choice as to who’s mine would go…the person who had played it many times before, Green. A couple more rounds on and the players were still only tentatively feeling their way. Red had chosen to diverge from the other player’s tactics slightly by going for a Saloon rather than mines and before long she was able to add the Saloon Girls to double its effect. When Pine won a bid and started the next round of bidding, he did not know what to choose, not really wanting to win the bid at all. So he bet one, When nearly everyone had passed and he looked like he would win the bid on one, he commented that it seemed unfair that he would be forced to pay some money, thinking that if everyone passed he would be the winner anyway. A quick check of the rules confirmed that indeed the player starting didn’t have to bid and could pass, and in the unlikely event that everyone passed, they would win. So everyone agreed to start the round again. Pine passed, Red Passed, Green, with an eye to the main chance then bid one—Oh the shouts of disgust that followed—he had passed last time so why bid this time? Well, it wasn’t worth two, but it might be worth one, and with that he won the auction. About a third of the way through the game, there were a couple of Mayors out and Red’s yellow Saloon was bringing in some income from Pine’s growing number of yellow mines. It was about this time when Pine decided he’d had enough and took the next dynamite card and, much to her disgust, blew up Red’s Saloon, taking the girls with it! In the meantime, Purple was trying to corner the green and red mines, while Black was settling himself strongly into purple mines. At this point Red decided that she was so far behind in the mining stakes there was little point in switching to that route so decided to stick to the “money by other means” strategy. She managed to get a second saloon and this time chose Black’s purple mines to be the target for her custom. This seemed to regularly provide income, but without the girls it was only two gold at a time, barely enough to cover costs. On the next table, Yokohama had barely started, so the group found something a little longer to play in Jórvík. This is a viking re-themed version of The Speicherstadt, which was a very popular game with the the group a few years ago. Last time we played the expanded version (corresponding to the original game with the Kaispeicher Expansion), but this time we did not want it to go on too long, so played the base game rather than the fully expanded one. Pine remembered it as the game where Vikings queue up, and called it “The Queuing Game”, and that sums it up pretty well. 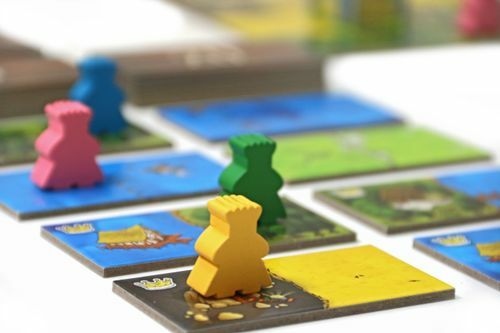 Players take it in turns to place their meeples in queues next to the laid out cards. Once everyone has placed their cards, each card is “sold” and the first player who placed their meeple next to the card has first dibs. The cards come in varying types, starting with contracts and goods – contract cards give victory points, but only if they have been fulfilled by collecting the correct goods. On the other hand, Market Cards allow players to sell goods and get a better return than usual, enabling the owner to build a supply of cash giving them power in the “auctions”. One of the most important cards are the viking fighter cards. When the “Attack of the Picts” come up at the end of each season, the player with the most viking fighters gets a bonus, but woe betide the player that has the fewest viking fighter cards as they will lose points in a “Devil take the hindmost” mechanism. The game ends when all the cards have been auctioned and the player with the most points is the winner. It only took one round for everyone to take up their differing strategies. Red, having not played the game before, had gone for a couple of market cards, enabling her to sell goods for one coin each rather than the usual two goods for one coin. Green had started a collection of Viking fighters to ward off the Pict raiders, Black collected the only artisan card, Purple went for the feast and Pine wasn’t really sure where he was going so had taken another market card. By the end of the second round Red had acquired three of the market cards, Green another fighter, Black and purple both had artisans, and Pine had taken the valuable warehouse. Black was dubious of Red’s strategy for so many market cards, as experience had shown that these cards were generally not that valuable as you did not often have the required resource to sell. Green was reserving judgement thinking that with three she could almost guarantee being able to sell something. Then the goods started to arrive. Everyone seemed frustrated at what they could actually get and money soon ran very low, except for Red however, who always seemed to have more than anyone else; those markets were beginning to prove useful. Pine’s warehouse seemed pretty empty however and although Green’s defense of the Picts was mighty, there wasn’t a lot he was defending in the early stages. As the game wore on, Green inched up the score track as Pine, Purple and Red slipped back, due to Pict raids. By the last round, almost everyone was spent up with no more than one or two coins each, except Red who seemed to have a stash of seven or eight. This meant that she was able to hoover up both the end game scoring bonus cards (the ships and the coins) and this left an odd position that didn’t seem to be covered in the rules. The very last card in the Winter deck was the attack of the Picts card, which meant that all the other cards had been out and selected, and only two cards remained, both attack of the Picts cards. Normally, the Attack of the Picts card would have been enacted as soon as it was revealed and then discarded, which is why the cards fit the slots perfectly. Pine felt the game should end there without activating them, but since we did need to have the final attack card everyone else felt that the game probably meant both attacks should happen, one after the other. Considering that there is a one in fifteen chance of this happening, it really should have been mentioned in the rules. It quickly became clear why Pine wasn’t keen on activating the Pict cards: he had seven points to lose and Green had seven to gain! It didn’t matter though, because in the final scoring Red trounced everyone, proving that some cards are more powerful than we could ever imagine. Black and Green were tied in second place, much to their chagrin, as both had thought it would be one of them in first place; checking the tie breaker, it was Green took a somewhat Pyrrhic victory. While all this was going on, after some four or five months, Ivory was finally getting personal with Yokohama, and it seamed he was finding that it had been worth the wait. It had taken quite a while to set up and was quite a “table-hog”, but it looked much more complex than it appeared to the players on the neighbouring table. Yokohama has a lot in common with Istanbul—although it is unquestionably a deeper game, the principle is very similar. In Istanbul, players take it in turn to move their Merchant around the bazaar to locations where he can carry out specific actions. Merchants can only carry out actions at locations where there is one of their Assistants or where they can drop off one of their Assistants. 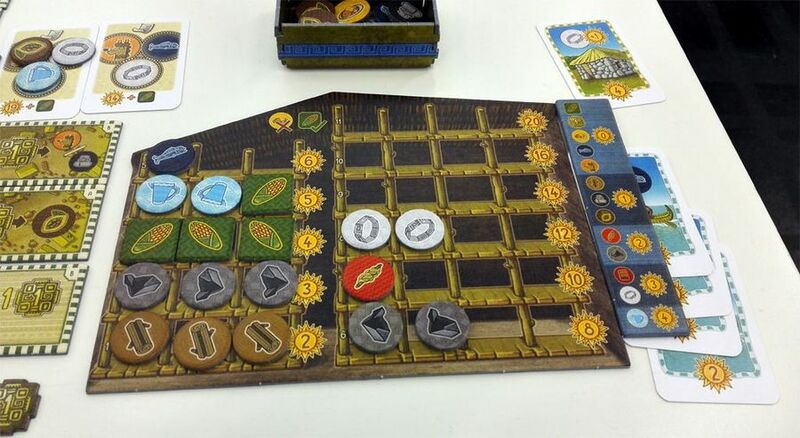 Yokohama has a similar travelling Merchant mechanism, but before he moves, the active player places Assistants, three in different locations or two together at the same location. The difference is that in Istanbul the distance the Merchants can travel is limited, whereas in Yokohama, they can travel as far as they like, but can only travel through locations that are occupied by one or more of their Assistants. One of the most significant differences between the two games is that the action a player can take depends on the “Power” they have at their Merchant’s location. The Power is the sum of the number of number of Assistants, Stores and Trading Houses present, plus one for the Merchant. The nature of the locations are more complex too, some just provide resources or money, but others provide opportunities to get Contract cards, victory points or even technology cards that can be used during the game. Another key difference is that each player is provided with a small number of Assistants at the start of the game. Although any Assistants are returned when their Power is used to carry-out out an action, players inevitably need more, which they must obtain by visiting the Employment agency (where players can also buy Stores and Trading Houses). Despite the similarities, the games have a very different feel about them, though they are both very smooth to play with very little down-time. 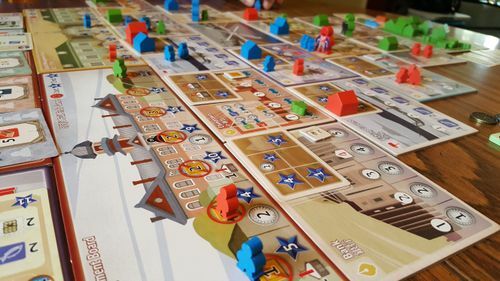 Yokohama has a number of end conditions, including drawing the last contract card, filling a given number of spaces in the Church, or Customs locations, or if one or more players has built all their Trading houses or Stores. In this way, it is up to the players how long the game goes on, which was definitely something that affected the way Blue, Burgundy and Ivory played. The game began with Blue picking off the highest scoring Contracts while Ivory decided to build some technology, in particular the ability to place a fourth Assistant, something that proved it’s worth as he used it extensively throughout the game. 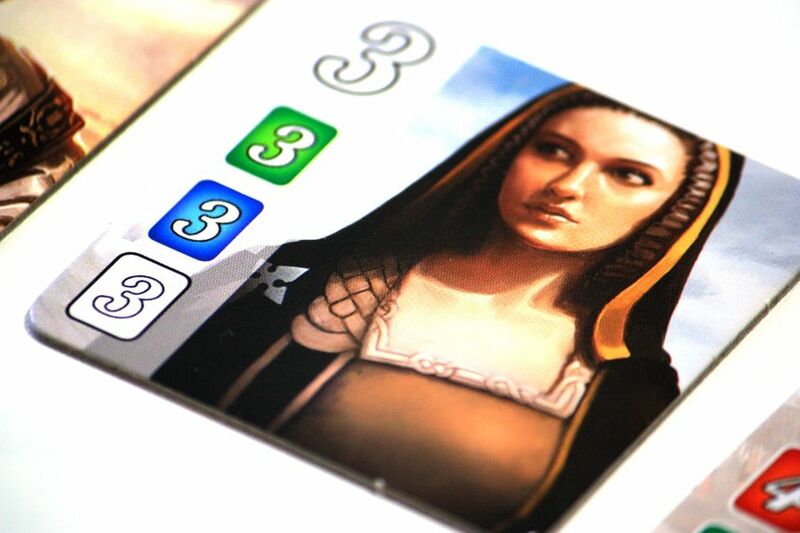 Burgundy followed Blue with the Contracts, but was generally beaten to the most valuable cards. As the game developed, all three players began to get into their stride a bit more, and when pine looked on in horror at all the pieces and commented that it definitely looked like an “Ivory sort of game”, all three agreed that it was no where near as complex as it looked. And that was just as well, because Yokohama has a lot of fiddly pieces and does look especially complicated. Up to this point though, everyone had been hitting the Contract cards quite hard, when Burgundy suddenly pointed out that there weren’t many left and if we continued that way, the game would be over quite soon. Clearly nobody wanted that, because everyone switched their attention to other sources of points. It quickly became clear that all three players had spotted the value the Customs house could provide, and since everyone was beginning to build up a small stack of valuable “Import” crates, it became a race to get there first. Inevitably, Ivory got to the Customs house first, followed by Blue and Burgundy. Blue had more Import crates though and was able visit several times and hold the majority. Ivory spotted that there were points to be had by visiting the Church, which the others had completely neglected and Burgundy took one of the achievement bonuses for having built in three commercial and two production areas. This was something that everyone had tried to go for, but had been sidetracked from. Ivory snaffled the bonus for being the first to achieve six bundles of silk with an extremely clever move, while Blue who had always had more money than anyone else picked up the bonus for being the first to have ten Yen. It was clear that the game wasn’t going to go on much longer, but everyone was concentrating on trying to eke out those last few points in what felt like a close game. Learning Outcome: Some games are worth the wait. 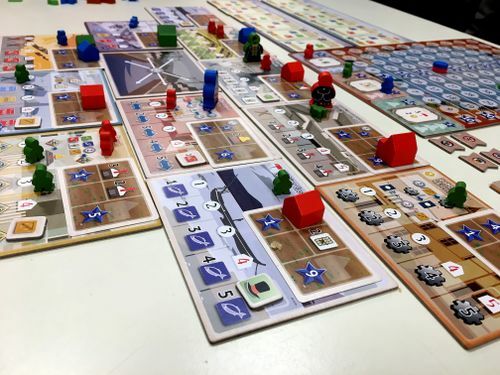 This entry was posted in Games Night and tagged Boomtown, Coloretto, Istanbul, Jórvík, Kaispeicher, NMBR 9, The Speicherstadt, Yokohama on April 3, 2018 by nannyGOAT.